You may be familiar with R for data processing and analysis. But do you know how to easily import data that is in Campbell Scientific’s TOA5 format into R? In this article, I’ll briefly discuss R and TOA5, and then share a function to create an R dataframe from your TOA5. R is a powerful, open-source software environment for statistical computing and graphics. It is also popular for its ability to produce publication-quality plots with the necessary mathematical symbols and formulas using UNIX, Windows, and MacOS platforms. Recommended for You: To learn more about R or download R, visit The R Project for Statistical Computing website. The TOA5 file format is the default format used for data collected from any contemporary Campbell Scientific data loggers. This format is a simple comma-delimited text file that has a .dat extension. The TOA5 file format includes a four-line ASCII header with information about the data logger you’re using to collect your data. In addition, the header describes the data values with variable names and units of measurement—if they are available. The first line contains information about the data logger, such as the serial number and program name. The second line is what most people would view as the data header as it contains the names of the variables stored in the table. The third line consists of the units for the variables—if they have been defined in the data logger. In the fourth line, there is an abbreviation for the processing the data logger performed (for example, sample, average, standard deviation, maximum, minimum, etc.). Recommended for You: For more information about TOA5, refer to Appendix B of the LoggerNet instruction manual. 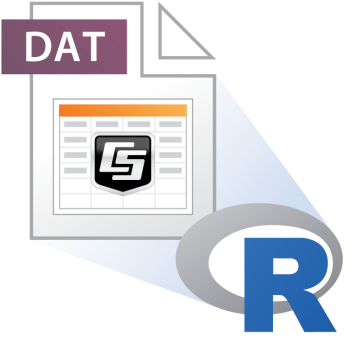 When the RetOpt (Return Option) parameter is omitted or is “data,” an R data frame is created with the second line of the raw data file used for the names. The TIMESTAMP is converted to what R recognizes as a date and time stamp so that this information can be used in graphing, time-series analysis, or the aggregation of data based on date or time. You can download this code. I hope you find this function useful in your data processing and analyses. Feel free to post your comments about your experience, or your suggestions, below. Credits: The R logo is © 2016 The R Foundation. The logo was used without modification and with permission in accordance with the terms of the Creative Commons Attribution-ShareAlike 4.0 International license (CC-BY-SA 4.0). This article is quite useful, although your code has some mistakes: you use 2 variables names for the same object (stn.data / station.data & stn.info / station.info), so the function stops & returns an error. By the way, the way you use scan & read.table gave me an idea for enhanced functions to read TOA5 data (and why not, later, other data formats ?). I would like to publish that work, as soon as it will be done, on the CRAN (maybe under GPL V3) to make it available for the R users community. For this, I would like to have your authorization for using your code as a basis, if you agree with that idea. Thank you for pointing that out, JM! Looks like I introduced that typo in condensing the code to fit the page. It's fixed now and a downloadable version added. I like the idea of expanding and enhancing the function and, as far as I'm concerned, anyone is free to use and modify my code as needed. I'm interested to learn more about your ideas and possibly collaborating. You're welcome to contact me at dbaker@campbellsci.com. Awesome! Great to see R represented in a Campbell blog. I've written a short R script also to read TOA5 data, it's pretty handy to separate out the 4-line header from the data.